Gray School of Arms Fence for charity event — Gray School of Arms. Western Martial Arts and Fitness. 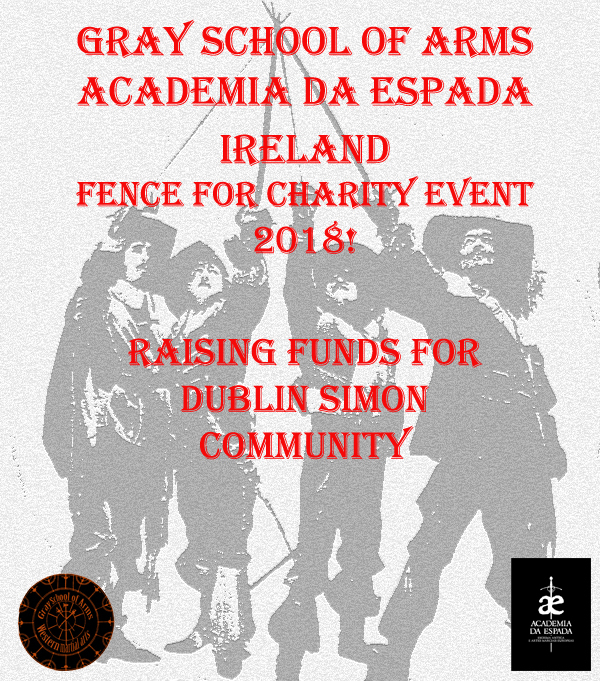 Gray School of Arms Fence for charity event, is an event to help raise funds for the Dublin Simon Community charity. The event is held once per year and is open to all fencers both classical, sport/Olympic and western martial arts/HEMA practitioners. Each event runs for 3 hours allowing fencers to fence one another with all proceeds being donated to the Simon charity. The Dublin Simon community charity is a long established charity, with hundreds of volunteers working diligently to help combat the ever increasing homelessness problem that Ireland is facing. With this event we hope to do our part in helping our fellow humans beings in getting the help they need to get off the streets and get back control of their lives. Don't have spare funds? no problem you can help by spreading the word and donating blankets, tents and other items to help.